With all the zombie/living dead comedy-horrors being released by major studios and independent filmmakers, using "zombie" and "dead" word plays in their titles, these days, it isn't too often I'll hear one that really stops me in my tracks. One that recently did was Bee-Stung Productions' upcoming Zombinatrix with Bianca Allaine as the title character; "Mistress Tawny." It was the title that first grabbed me, but it was the tagline; "She's into whips and brains!" that just wouldn't let go. 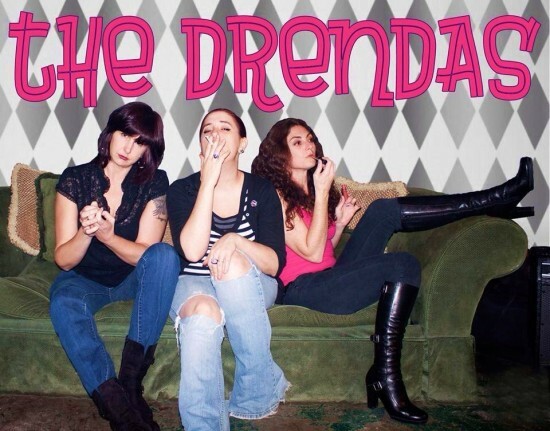 The Drendas are an all-female rock band, hailing from Norfolk, Virginia. The ladies; (above, left to right) Denise Lawrence (Bass, backing vocals), Holly Womack (Guitar, lead vocals), and Collette England (Drums, backing vocals) formed in the fall of 2012 and have since made quite a name for themselves around the Tidewater region club circuit, playing their blend of garage rock and surf punk. The band released their debut EP Boy Trouble, in May of last year and have recently released their sophomore EP; Stuck in Your Head. In between their frequent live performances, Holly tells me they plan on recording more songs in the near future with a few different producers in their home city of Norfolk.